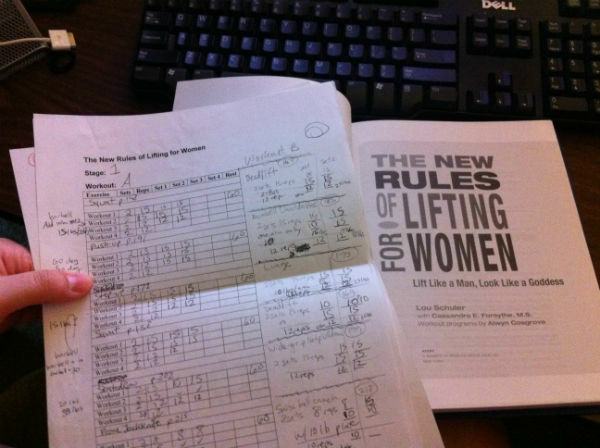 I unearthed my copy of The New Rules of Lifting for Women not long ago. Now that my shoulder is on the mend, I’m wondering when would be the right time to start a new training regimen. My much-used copy of the book, plus old scribbled-upon worksheets to track my exercises. I don’t want to injure myself by starting too much, too soon. The gym at my office has weight machines, a weighted bar with different sized weights, and adjustable dumbbells. The only problem is, the dumbbells only range from 10 pounds and up in heaviness, unless you want to use the dinky little handheld metal bars from inside the dumbbells. I am tempted to bring my 5- and 8-pound weights, but it would be a pain to lug them to the office every time I wanted to work out and still have them available at home for my physical therapy workouts. I could do a little of the training at home and build myself up to where 10-pound weights wouldn’t be as big a problem, but my home gym doesn’t have all the good stuff the one at work has, and I don’t feel those workouts would be quite as effectual. These workouts were difficult, and I had to be careful with the squats and lunges because of my joint problems, but they were also great for me; I felt so much stronger, I put on some muscle without getting bulky, and I lost fat. I loved them. Is adding this workout plan to my rotation too ambitious? How many weights workouts should I mix in per week with my daily stretches, 2-3x/week physical training workouts, and 1-2x/week pilates? Would two workouts a week be too difficult to schedule around work, overtime, and spending time with my boyfriend? How much do I really like having free time? I suppose Nanowrimo never had a chance with me this year. Heh. I hope to get to a point in the next two to three months where I can stop the physical training workouts completely and focus on other exercise routines. I’ll have to consult with my doctor and maybe go back to my physical therapist for a single session to know for sure when I can stop those. Rereading this book will be beneficial more than ever now that I’m a meat eater; there are a lot of recipes that I will now give a second look. This entry was posted in fitness and tagged Exercise, fitness, weightlifting. Bookmark the permalink.